During the 1920s Woolworth worked with Crystalate to develop a substantial record business, selling hit songs for sixpence. Crystalate had been born out of a merger between the High Street retailer's two suppliers, and had introduced seven inch electronically recorded 78s on the Victory Label in 1926. By 1930 sales had reached a million records a week, but production costs were rising and the profit margin on each record was low. The Woolworth Buyer worked with Crystalate on a plan to double sales and increase the margin while holding the price down to sixpence. Discs would be made of a new wonder material, Shellac, which was cheaper to handle and would allow larger eight inch record, with another minute's playing time. The repertoire would include a mix of popular hits and catalogue favourites, along with comedies, instrumentals and religious music. 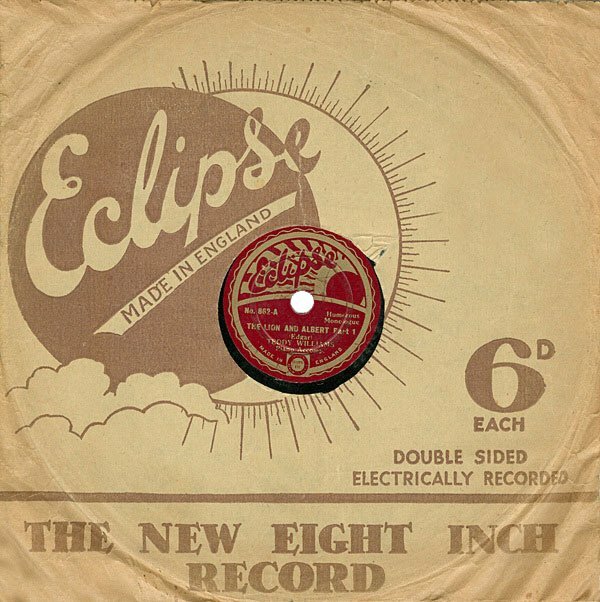 To mark the change the Victory name was dropped, after research revealed that the name was perceived as old-fashioned (unlike the records), in favour of the modern-sounding Eclipse. Our digital gramophone feature includes a wide selection of the songs, which you can play on-line or download for later. "The Lion and Albert" a monologue made famous by Stanley Holloway was recorded for Woolworth's by Teddy Williams back in 1932. His accent can best be described as Lancashire meets Yorkshire on a train to Essex, but the result is still quite fun.